We had a trip down to Bristol today and came home with an unidentifed Lister autotruck - does anyone know where it came from or which one it is? The loco was bought from Joe Nemeth Engineering and is a genuine Lister - they also have a home made one which would make a good model but this is not the one we bought (check their website for details of their home made stuff). The Lister was found in a container as part of a clearance after the owner died - he evidently owned more than one Lister so we have a mixed bag of bits including some from a petrol Autotruck. I suspect that the frames are from an older petrol loco with the gearbox / clutch from a newer diesel. The frames have been fitted with new hornguides, axleboxes & bearings, the wheels have been turned and the whole lot has been assenbled into a rolling chassis. There will be a lot of extra work to do to make it run and stop (but nothing we haven't done before). The alleged number is 10881 but this isn't on the usual Lister lists - does anyone know anything about it? it would be good to know which one it is and where it's been. Hi Adam, I am aware that Joe has been selling items that belonged to the late Les Anderson (of Minirail fame), notably the ex-Dudley Zoo/Flamingoland articulated railcar set that has arrived at Cleethorpes. I suspect the Lister is from the same source, Les certainly owned several over the years, including those now at Lappa Valley, Paradise Park and the motor unit under a Railcar at Oakwood Park (ex Longleat). Potentially a lot of parts could have been interchanged! Thank you everyone - this helps to explain where the Lister has come from. I am not at all sure which loco it actually is - I think it was dismantled for spares and has then been reassembled. The frames are from a well used petrol loco which has been converted to diesel at some stage (you can tell by the holes in the frames - the petrol engine needs different mounting points to the diesel). The hornguides with the loco are however the later built up type and are badly damaged - these have been replaced by new cast hornguides (a major selling point). The gearbox is really nice (another major selling point) but doesn't seem to match the frames - it also has a choice of early and late input shafts to suit early and late clutches along with a late type clutch and half an early one. All in all I think it is an assembly of different bits rather than anything else - someone will decide on a number at some stage. In the meantime it needs a name - can anyone think of a good name for a mongrel? Mutley perhaps? Adam Roper wrote: In the meantime it needs a name - can anyone think of a good name for a mongrel? Mutley perhaps? Your Lister sounds like the Johnny Cash song from 1976 called "One Piece At A Time". It belongs to Neill Clayton and will join 7954 & 50191. This will give a fairly nice set of open, flying bedstead and petrol Listers. The missing bits will help keep the weight down to an acceptable level for towing - by adding wooden ballast weights it should look the part while allowing Neill to go round the country with his girlfriend visiting different railways. For my part we have finally reassembled 50191 and I nearly died getting the rebuilt engine to start as it was rather stiff with its new bearings. Fortunately we had a qualifed first aider on hand in case it all went wrong. Did anyone else go for a ride on the Olicana railway? In an episode of Red Dwarf (which has a character called Lister) they arrived somewhere to find a 'being' that was made up of bits of the four of them. A line spoken by this thing went something like, "I am Legion, for I am many". I'd say LEGION would be quite appropriate. 'Gelf' might be more appropriate - it is certainly a mixture of unlikely bits! Hmm... on the same theme, perhaps Polymorph? I wonder which emotion it would drain from each of us? Polymorph is an excellent suggestion. Listers don't tend to drain emotions but they can excite them. This was particulatly the case when I nearly got my fingers caught under one of the end ballast weights - these weight an awful lot and will happily crush any body parts that happen to get trapped under them. There's nothing subtle about Listers - they had a foundry and knew how to cast. If it can't be made from girders, cast iron or wood then the locos didn't have it. Incidentally Listers were also famous for wooden garden furniture which you can still buy (Neill's got a coffee table) - the link is http://www.listerteak.com.au/#!about. Do I get any points for getting further off topic than anyone else? The Link caused the message not to show Adam, I've edited the link to remove the end of it and it looks like it still works. Adam Roper wrote: Polymorph is an excellent suggestion. Incidentally Listers were also famous for wooden garden furniture which you can still buy (Neill's got a coffee table) - the link is http://www.listerteak.com.au/. That seems a pretty good idea, same applies on the MER and some of the trams are still going strong with a hundred years and a million miles on the clock. Beats the modern tinfoil and plastic construction if you ask me. The Lister is confirmed as a total mongrel - I have tracked down the Autotruck used to supply the engine / bonnet and found that the rest has been used to rebuild another truck so I am therefore happy. The recognised authorities have decided on chassis number 10881 so I will go with this. 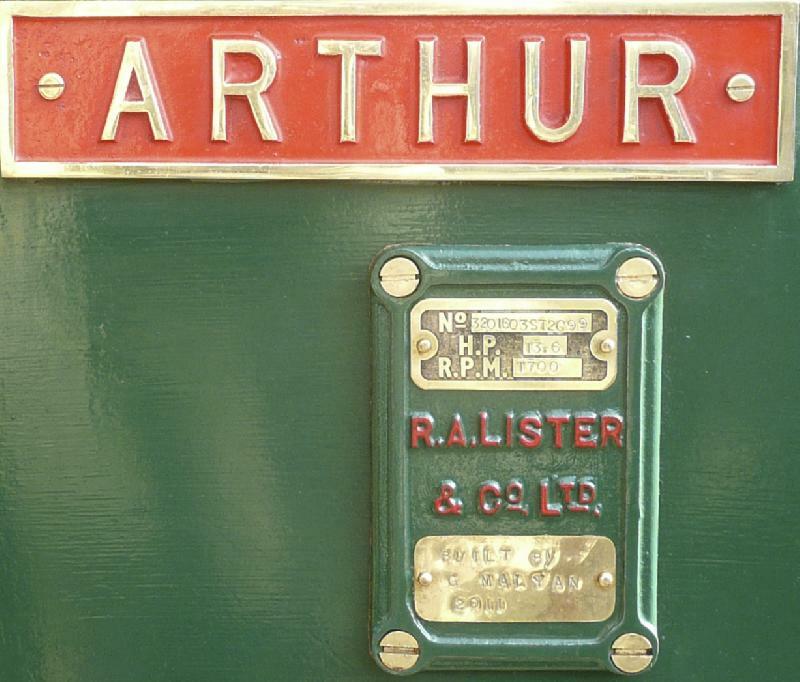 Does anyone have a chassis number for the Longleat Lister Pooh / Lappa Valley Lister Arthur? There should also have been a post 1960 Lister in the Minrail fleet - any sugesstions for its identity? As far as I can make out his No is 3201603ST2G99. I hope you can see that on the attached photo. 'Tigger' was recorded in a 1975 stockbook as 2ft gauge 7280 of 1936 - this is now the power bogie of 'Lenka' at Oakwood Park. 'Pooh's build date is more likely to be 1942 than 1952, Brian Gent's list in 'The Narrow Gauge' no. 111 (Spring 1996) indicates that surviving 20449 is of 1942 vintage, and 20886 is from 1943. The only 1952 reference I've come across is on the old Longleat Railway website, I suspect this is a mistake. Could you possibly give the source of your thought that there was a post-1960 Lister with Minirail? From the list in Brian's article there are no stand-out examples that it could be. The post-1960 15" Listers are 51721 (1960) - 'Les' at Ravenglass; 51989 (1963), Bure Valley - ex Peat railway; 52579 (1961) - ex target railway. Of course, any post-1960 ex-Minirail machine could have been re-gauged, as are most of the other pre-1960 Listers that are 15" gauge, making it tricky to trace, although I'm sure the Cleethorpes and Rhyl examples aren't ex-Minirail. I am fairly sure that there is another ex-Minirail Lister, as I'm of the impression that the generator car that used to push 'Amber Arrow' around at Longleat, Axe & Lyme and early Lappa Valley days was a Lister frame if nothing else (or was it the generator for the Rapido Rail set?!). The 1942 date for 20698 is correct - this is recorded as new to Tweddles and Smalley (1920) Ltd. Rochdale, Lancs on Brian Faulkner's list - http://www.railtruck.org. Zebedee went new to Coventry Corporation, Baginton Sludge Disposal Plant (a glamourous location) while Tigger went new to Raunds Manor Brickworks, Northants. Number 10881 isn't on the list although this isn't unusual - the list was on index cards which someone went through looking for locos amongst all the road trucks - some locos were missed. Sadly we can't now check as the original records have been destroyed. However 10881 would have been built in 1939. The reason I think there was a post 1960 Lister in the Minirail fleet is that the pile of bits includes a set of fabricated hornguides - Lister went over to these sometime around 1960. There is also a clutch off a 1960's Lister along with all the bits to work it. There were several 60's Listers on the Somerset peat railways - I wonder if one of these joined the Minirail fleet? The Cleethorpes Lister is 35811 ex Clay Cross - the Rhyl one is 10498 supplied new to John Board, Bristol Road, Bridgewater. I am pretty sure these weren't ex-Minirail. So what does the number on the photo I posted relate to? Cross Kitter wrote: So what does the number on the photo I posted relate to? Thats the plate from the engine by the looks of it Simon, hence the HP and RPM being quoted on it. The builders plate for the loco is normally on the frames. The picture of Arthur was very useful - it helps me a bit if only to confirm that they don't know which one it is either! I sent a PM last week but it doesn't seem to have worked so I will post the info here. The cast iron backing plate is off a Lister D stationary engine and is not off a loco (we've got a few D's in the shed so we're familar with them too). So 3201603ST2G99 is a 1982 engine, the 1603rd in the year, type ST with 2 cylinders. Not sure what rotation G is but its probably reverse rotation i.e. it goes anti clockwise when seen from the starting handle end (Lister locos should be as the gearbox is set up for the JAP petrol engine which went that way anyway). All of this helps me get one step closer to working out what we've got. The bits are a mixed bag - there are some spare corner plates which must have had a Longleat cab on at some stage and there are some broken 1960's axlebox guides which must have come from somewhere while the gearbox doesn't seem to have been used at all. On the whole 10881 seems likely to be correct. I think one thing we have to bare in mind is that although Les Anderson/ Minirail were one and the same Minirail must have been pretty much defunct after the Axe and Lyme project. Anything Les had before his death was not necessarily Minirail's, he could have picked up all sorts of oddments along the way in more recent years, certainly Joe Nemeth had some interesting bits. What do we know about the history of 10881? The only picture I have seen of the generator truck has it hidden behind another item of stock, it looks rather like a low curtain sided-van (lower than a canopied Lister).